Last night I went home with every intention to wash and block my sweater parts for Hey Teach, but ended up eating dinner, watching TV and engaging in some interesting conversations with Matt. Ah well, I can do it tonight or this weekend some time. Instead of working on Sprucey Lucy during TV watching time, I decided to pull out my Mini Mochi sock that’s been hanging around not getting any love lately. Since I decided to do an afterthought heel (for the first time ever), it was difficult to tell how tall the leg really was. I wanted to know how this whole afterthought heel would work and how it would fit. After realizing Sprucey Lucy needed much more to the foot then I thought, I was feeling a bit anxious about the fit of these. I decided the leg was long enough and did the ribbing. I then picked up the heel stitches and knit the heel. I don’t love the heel and I don’t love how the sock fits. Turns out my fears came true and the sock really isn’t long enough in the foot. It measures 8.25 inches from toe to heel and my foot is 9.5 inches long. Since I’ve already cut the yarn, knit the heel and have plenty of yarn left to make two more socks, I’m going to do just that. 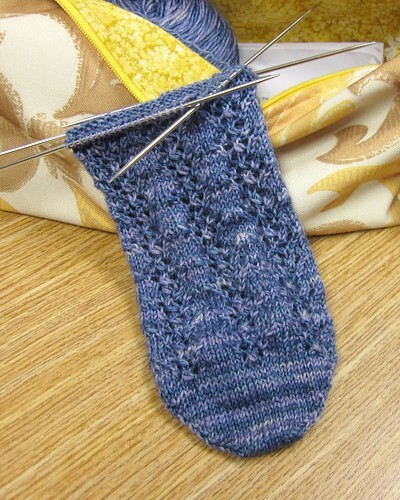 I’ll knit two more socks and frog this one for heel parts. This time, though, I’m going to do a short row heel while I’m knitting because I really don’t like the afterthought heel or how it fits me. I do love short-row heels, though, and with extra yarn available to knit from as I go, I think this is the best plan. I’ll probably make the sock 62 stitches instead of 60 because 60 seems just a bit too snug on my foot. In yesterday’s blog post, I mentioned how I wasn’t really sure about the fit of Sprucey Lucy and mentioned I was debating ripping out the heel and adding some length to the foot. After last night’s issue with the Mini Mochi sock, I decided I better rip it out now before I have another finished sock I don’t like! This will be the second time I’ve frogged the heel of this sock, but I think of myself as a “fearless frogger.” If I don’t like it or needs to be fixed, I should just DO IT! I’ll be so much happier in the long run and I know it, so I’ve learned to just accept that sometimes things need to be ripped out. I’ve yet to do an afterthought heel. I hate to fix what ain’t broken and change my fav heel technique for the sake of changing. I think the Mini Mochi is beautiful. I hope you realize how helpful it is when you share about your not-so-successful exploits. I learn a lot. Thank you! I’m glad to know it’s helpful. 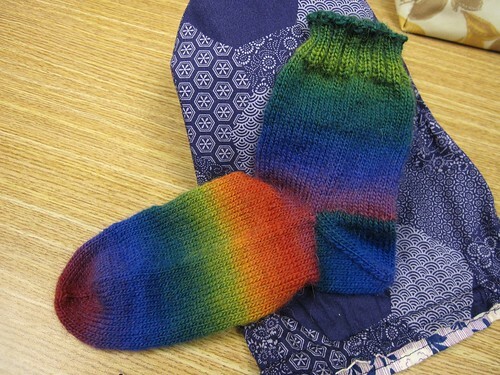 Sometimes I think there aren’t enough blogs that talk about the non-successful knitting projects. Not every one can always be a winner and we all make mistakes! I always hope someone can learn from the mistakes or happy accidents I’ve made, so I’m so glad to hear that you do. I just found this blog through links. What attracted me in part was the “Knits and Gardens” because I have a knitting blog and a garden blog, and haven’t found other garden blogs yet. I like your commentaries, particularly some of the “booboos”, we all make those and can learn a lot from them–and it’s even better if I can learn from a mistake/misjudgement someone else made–let them do the frogging. I like what projects i’ve seen. Haven’t checked older posts, where is the “garden” part? maybe that will come when you’re settled in the house. well i’m glad you have a solution for the mini mochis. that yarn is too yummy to pass on! The colors of the mini mochis are beautiful! Gorgeous yarn! I just started the gussets of Sprucey Lucy. It took thousands of repeats before I finally got the lace pattern. I think I have it, anyway! Yours look great!